Sometimes two people have to fall apart, to realize how much they need to fall back together. Wow. That's the only thing I can say. I thought that there was no way human possible that I'd love Point of Retreat more than I loved Slammed. I was wrong. Oh boy, was I wrong. Even if it left me emotionally wrecked. 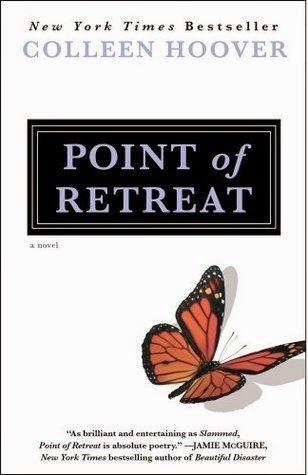 Point of Retreat is the sequel to the New York Times bestseller Slammed. This book is told from Will Cooper's, the main love-interest's point of view. It begins at the point where Slammed left off and brings back all the feels. As a matter of fact, I actually feel like I enjoyed reading from Will's point of view more than I enjoyed reading from Layken's. It was interesting because of all of the feeling he experienced. When you're reading Slammed I guess that the thought of his feelings never linger around. You are so focused on Lake's thoughts and feelings and her surroundings that you, for a moment, forget about Will and what he does on his spare time, what he thinks and what he feels. So reading this; where you get to know him a lot better, was incredibly nice. There were a few scenes where I cried, obviously, because of things that were unraveled in this book. There were some very sole-crunching, heart-wrenching, body-destroying parts, but there were also some really happy and blissful ones. They were much needed, even the sad ones. And, of course, as always, Colleen Hoover never fail to impress. Oh, and another thing. Butterfly you. BUTTERFLY YOU, oh how I love it. I use it on a daily basis these days. Butterfly you was right on point. All I could feel was glee during the beginning of this book. I loved all of it. I loved the relationships. I loved the break-up. I loved the poetry. And I loved - sorry, love - the Avett Brothers. Kiersten is my favorite. I don't think I've ever loved a character as much as I love Kiersten. She's just so ... so, so perfect. "She says if everyone would use them enough, they wouldn't be considered cuss words anymore and no one would ever be offended by them." I could not had said it better myself. So much perfection in a little girl. I'm happy there was a break-up. I don't think this book would've been as great as it was without it. I think Bethany made the whole thing better. Not in there relationship obviously, but her being apart of all this made Will realize how much he actually loved Layken. This is phenomenal, just like all of Colleen Hoover's other books. I have so much love for this story, for Will, for Layken, for Colleen Hoover and - obviously - Kiersten. A guy can tell a girl he's in love with her until he's blue in the face. Words don't mean anything to a woman when her head's full of doubt. You have to show her.